Automated Installation of WordPress on Rackspace Cloud Sites is a guided step by step guide to install WordPress on Rackspace Cloud Sites by following wizard. Automated Installation of WordPress on Rackspace Cloud Sites is a part of planned progress of formerly known Mosso System or better known as Rackspace Cloud Sites now, for easy Installation of WordPress on Rackspace Cloud Sites. However our old guide on Installing WordPress on Rackspace Cloud Sites is still relevant as a manual method of WordPress installation for sub folder or an already added websites which wants an upgrade. This Automated Installation of WordPress on Rackspace Cloud Sites is not like those simple scripts used on third class web hosts, it is a kind of version of that used on Red Hat Openshift. In other words, if someone not aware of the technology of Rackspace Cloud Sites and asks how you have installed WordPress (in WordPress forum or somewhere for troubleshooting), you will answer that, you have installed WordPress manually by FTP uploading (like our old guide). A new option has been added on Add a Site wizard, in third step of the wizard for adding a domain or subdomain, you will get a check box for Automated Installation of WordPress. If you enable this, by default the option Linux / Apache/ PHP will be selected and one database will be added. In other words, if you enable this checkbox, you will not need to do anything but clicking the next step. But we recommend to add multiple databases option as it costs nothing. The interesting thing is that, this video has not been created by a human. All actions are replica copy of me. That is a separate story of Cognitive Science, Mind and Artificial Intelligence. If you watch repeated times, you will see the minute difference in mouse movement by a human (that is me) in few frames. Enjoy. This Article Has Been Shared 5326 Times! 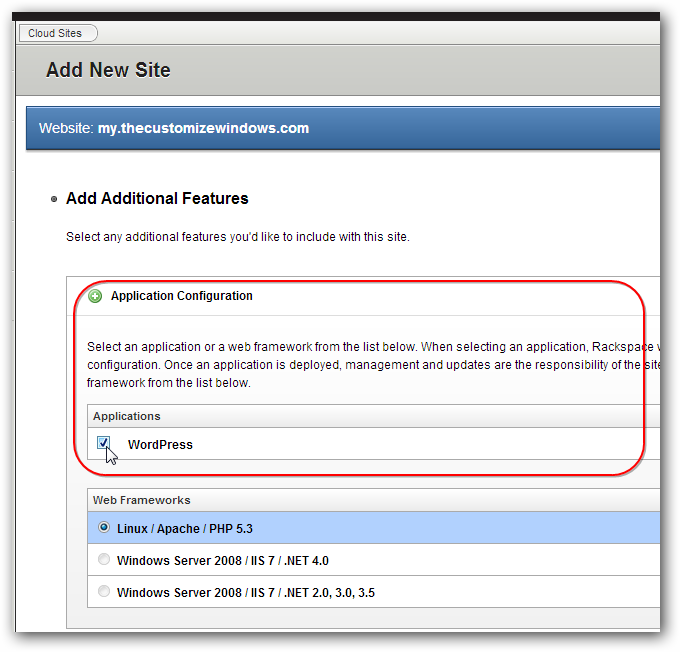 Cite this article as: Abhishek Ghosh, "Automated Installation of WordPress on Rackspace Cloud Sites," in The Customize Windows, November 12, 2012, April 25, 2019, https://thecustomizewindows.com/2012/11/automated-installation-of-wordpress-on-rackspace-cloud-sites/.